Originally known as Square Scipion, it was renamed after a French naturalist and explorer, and has an unusual fountain, a childrens playground, park benches, etc. 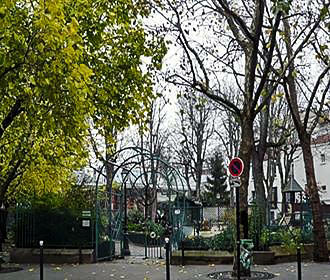 Originally this square in Paris was known as the Square Scipion due to its location by a mansion house that was built by the financier to Catherine de Medici and after his death it was turned into a hospital. And although trees had already been planted within the area in front of the hospital in the 1830s, and it had been named Place Scipion, it was first truly laid out as a square in 1899, and this was when it had a change of name to Square Scipion. 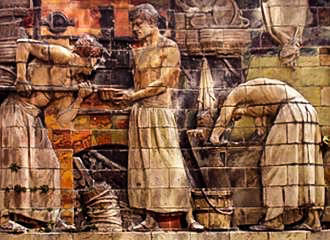 Within the square you will find a ceramic mural in bas relief, which is entitled The Bakers, or in French this would be Les Boulangers, and this was produced by the sculptor Alexandre Charpentier and the artist Emile Muller. However, this statue was originally produced in 1897 and situated within the Square Felix-Desruelles, yet it was moved to the Square Scipion for the 1900 World Fair in Paris and is where it remains today. 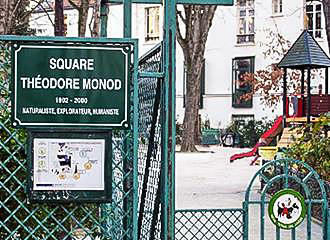 Now the square generally remained the same for many decades and did not actually change its name until 2011, when it was renamed the Square Theodore Monod and was inaugurated on 22nd November 2011. You will find a plaque located by the pretty pergola style entrance to the Square Theodore Monod, which was unveiled at the ceremony and it states his date of birth and death, along with the fact that he was a French naturalist, explorer and humanist. Now, also within the Square Theodore Monod you will find a water fountain, however there are steps on either side of this along with plenty of flowers, but you can also discover cherry, chestnut and Japanese pagoda trees, while relaxing on one of the park benches or watching your little ones playing in the childrens playground. You will find the Square Theodore Monod located in the 5th Arrondissement not far from the former royal botanical gardens now known as the Jardin des Plantes, and it is normally open from around 9am through to 5pm, however, the closing times do vary according to the seasons, as it is open later in summer, but we would like to point out that unfortunately certain areas are not accessible to the disabled. Now when it comes to getting here vai public transport in Paris, the nearest Metro stations are the Les Gobelins stop or the Censier - Daubenton stop, both via line 7. Yet the nearest RER stop is at the Gare d’Austerlitz train station that serves line C along with the Metro lines 5 and 10, however, the bus numbers 27, 47 and 91 will also get you close by.